Studies have shown that more people are improving their over all health, fitness and vitality, when combining a program of exercise and nutritional supplementation and are achieving significantly greater results. We can help ensure that you don't damage your body and eliminate the confusion and frustration associated with the current health and weight loss fads. It is important to note that there is a right way, and a wrong way. When it comes to eating right, exercising and nutritional supplementation, you don't want to risk harming your body or wasting valuable time and money. 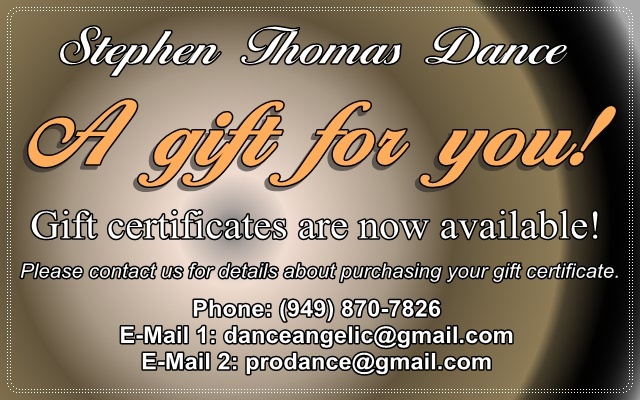 Call us today, and we can give you the proper guidance, tools, information and provide you with access to the highest quality nutritional products on the market which we use in our profession as professional dancers and athletes. We can help you increase the benefits of exercise through a multi-disciplinary approach along with proper nutritional supplementation. We recommend the USANA program, which is specially designed and medically renowned for its exceptional benefits, and endorsed by top professional and Olympic athletes all over the world. Before we design a personal program, we must take into account your current lifestyle, fitness and eating habits. We can help you analyze your personal goals, fitness goals and nutritional needs. We will also assess your current diet, and then develop a comprehensive fitness, diet and supplementation plan that best meets your unique needs. Our online Health Assessment and Advisor will help lead you in the right direction as to the products you should take. We would be happy to discuss any other questions you may have regarding these products, as well as offer our personal suggestions, recommendations and advice as professional dancers and fitness trainers. We recommend you take high-quality vitamins, minerals, and antioxidants to provide all your body needs for good health. The product line we recommend is from USANA Health Sciences. It was named Editor's Choice by NutriSearch Comparative Guide to Nutritional Supplements, and has highest rating of all nutritional products in the world. It is used by more than 50% of Professional tennis players on the Women's World Circuit, as well as many Olympic and Professional Athletes from all over the world. As shown in the extensive list on this website! USANA’s commitment to cutting-edge research and uncompromising quality standards are the foundation for products that are proven to be the best and safest in the world. That’s why leading physicians, world sporting organizations, world-class athletes, and smart consumers trust their health to USANA. So whether you are a dancer, currently active in leisure, or perhaps you have become inactive in your life over the years, we recommend USANA's nutritional program to everyone, to improve your general health and give you the best chance of gaining improved health and wellness, and re-vitalizing yourself! The Essentials are broad spectrum Vitamin, Mineral & Antioxidant Supplements. They are Pharmaceutical grade with potency, bio-availability and safety guaranteed in writing on every bottle. And, the only vitamin products approved by the F.D.A.! We recommend a balanced program incorporating these Essentials along with Biomega and Procosa for all of our dance students, fellow dancers and dance instructors, and for anyone from any walk of life, seeking to look and feel better through healthy nutritional supplementation. Biomega is based on many clinical trials. It's an ultra-pure natural fish oil supplement, that's double concentration. USANA uses only small young fish (anchovies and sardines mainly) so you would have to consume over 30,000 capsules of Biomega before you'd get close to the amount of mercury in one can of tuna! This is a prime example of obtaining the nutrition you require for your health that you cannot achieve through food alone! Procosa II (Procosamine II) is an excellent product for overall joint health. It is designed to help prevent the progression of osteoarthritis that occurs to many of us as we age. This is a total joint health product, that combines glucosamine with other ingredients to protect and rebuild cartilage. We recommend this to all people, and especially to, but not only, dancers, athletes or anyone who is physically active or involved in sports. Don't trust your body to just any nutritional supplement! Make sure to ask yourself which apple you would eat. How do you think your vitamin would compare in such an apple test? If you're not a believer yet, peal an apple and place it in a jar with your vitamin for 5 days. Need weight loss education? Want to earn additional income? Then keep on reading! Scientists developed The RESET weight-management program to help people jump-start healthy eating habits and begin to make a clean break from unhealthy, high-glycemic foods. But the five day period is only the beginning to a long-term weight loss and healthy eating plan. For detailed information about our weight loss plan, please click the link to our detailed full page dedicated to weight loss! Are you interested in generating extra income for yourself as well as living a healthier, nutritious lifestyle? Whether you currently have a job, are self employed or between jobs, we can show you how to integrate our business opportunity into your current activities. If you would like to learn how to start a legitimate and successful online health and nutrition business, without hassling friends, neighbors and relatives, please take a look at our business opportunity page on this site. There's something there for every one, whether your interest is in attraction marketing, social marketing, affiliate marketing or mlm marketing in the health and nutrition industry. This business opportunity goes hand in hand with dance, fitness, nutrition, medicine, nursing, health, wellness, sports, leisure, sales, anything related to lifestyle or life in general and so much more. So, please contact us today to see how we can integrate this opportunity into your current activities or create a new and exciting interest, and income stream, in your life! Check out our online business opportunity and contact us if you would like any information, or are ready to get started today! As long time professional dancers, we understand the necessity for dancers and all people to take care of themselves through nutrition and healthy living. We advocate a combination of exercise through dance and nutritional supplementation with a healthy diet and lifestyle. We recommend the Essentials range from USANA. The Essentials are broad spectrum Multi Vitamin, Multi Mineral & Antioxidant Supplements. They are the highest Pharmaceutical grade with potency, bio-availability and safety guaranteed in writing on every bottle. And, the only vitamin products on the market approved by the F.D.A.! Please get in contact with us today for information. The supplements are of the highest quality, being used by professional athletes all over the world. And, are endorsed by many world sporting organizations for their athletes! Procosa II (Procosamine II) is an excellent product for overall joint health. It is designed to help prevent the progression of osteoarthritis that occurs to many of us as we age. This is a total joint health product, that combines glucosamine with other ingredients to protect and rebuild cartilage. We recommend this to all people, and especially to, but not only, dancers, athletes or anyone who is physically active or involved in sports, or anyone who is interested in their general health and longevity! If you would like to learn how to start a legitimate and successful online health and nutrition business, without hassling friends, neighbors and relatives, please take a look at our business opportunity page on this site. There's something there for every one, whether your interest is in attraction marketing, social marketing, affiliate marketing or mlm marketing in the health and nutrition industry. This business opportunity goes hand in hand with dance, fitness, nutrition, medicine, nursing, health, wellness, sports, leisure, sales, anything related to lifestyle or life in general, information technology etc, and so much more. Please join us in forming a movement of health minded people in combining health and nutrition with dance and fitness, to enjoy greater health, wealth and freedom!